Posted by adkmassage in massage cruise. Elvis takes a massage cruise during boat parade! 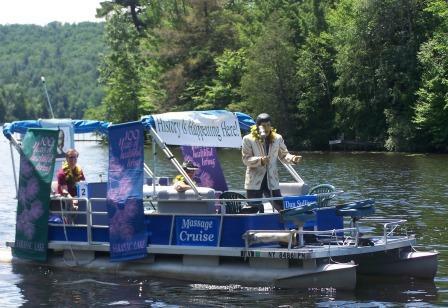 Historic Saranac Lake Business member Dan Sullivan, LMT MPA aboard the AdiROndaCK Massage Cruise pontoon boat featured in the first Great Adirondack Boat Parade held Saturday, July 5, 2008. Since a benefit of the massage cruise is feeling the rocking of the waters, the float’s theme is health and rocking. Therefore, Historic Saranac Lake supplied the 100 Years of Healthful Living – Saranac Lake, The E.F. Trudeau Stamp and History is Happening Here banners. Celebrity passenger Elvis aka The King of Rock & Roll of The Eat & Meet Grill is on the bow. Some of the songs played included: “Jail House Rock,” “Rock Me Gently,” “Rockin Robin” and “Rock The Boat.” Adirondack leis were created by Two Horse Trading Company. Dan is excited to learn more about Saranac Lake’s historic health and healing icons Martha Reben and Fred Rice and their local campsites.